Talented Magnum Photographer, Christopher Anderson, experienced something that completely changed his life. 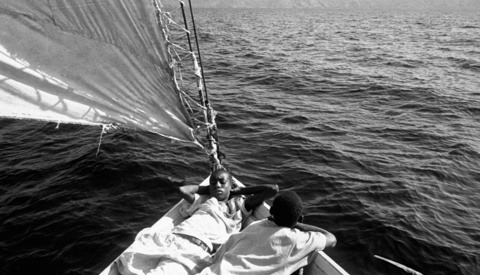 In June 2000, while traveling in Haiti, he met writer Michael Finkel and together they documented a group of 44 Haitians on their journey to the United States. A few days after they set sail, they realized the handmade boat was sinking. Anderson’s first reaction was to continue taking pictures – even though he knew there was a chance they may never be seen. On March 2011 a tsunami in Japan killed over 20,000 people and left thousands more homeless and destitute. Many people from all over the world came together to help the country of Japan during this catastrophic event. All Hands Volunteers was one of the many groups in that helped during the recovery and cleanup efforts. ...and a few non-classics... It's always a treat to see actors (or fake sharks) out of character in classic films, reading a script or speaking with a director. 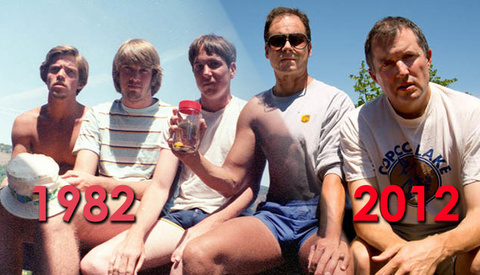 Here are some photographs that show just that from several movies over the last several decades. 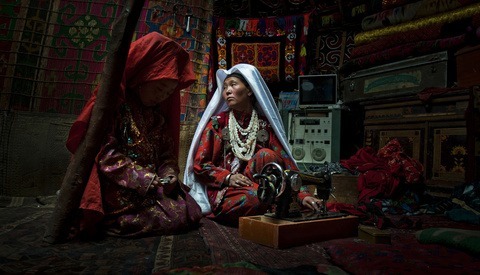 The grand-prize winner of National Geographic's 2012 Traveler Photo Contest was announced yesterday. Cédric Houin of Brooklyn, N.Y won a 10-day Galápagos Photography Expedition for two with National Geographic Expeditions. View a gallery of the three winning photographs along with seven merit winners and the Viewers Choice winners here. Besides being an excellent photographer, Blair Bunting (who you may remember from our Lamborghini Aventador video) is an avid aeronautics hobbyist. He recently had the opportunity to photograph a U.S. military F-16, which was an honor in itself. 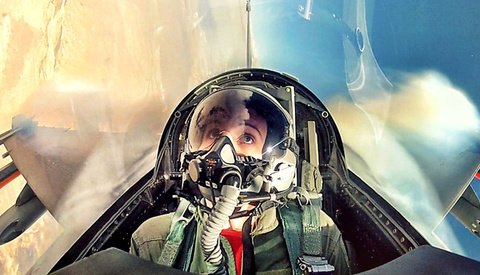 But when he was offered the chance to fly in the jet, the experience was once in a lifetime. Check out the GoPro madness! When it comes to photography, it takes quite a bit to drop my jaw these days. It's not that things are awesome, it's that I've seen so much that it's hard to stand out. 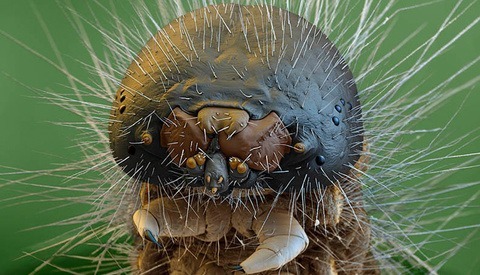 Well, these photos taken with an electron microscope floored me. Due to their microscopic size, we rarely get to see these creatures in such striking detail. To be able to see the eyes of a caterpillar, the hairs on the back legs of a parasite, or the ridges on a worm just boggles the mind. Earlier in the year, Fstoppers showed you how Sports Illustrated photographers photograph a superbowl. Just as the 2012 Olympics in London have come to a close, Reuters has released a behind the scenes video on how their photographers take images during the world's most celebrated sporting event. It's pretty interesting to hear from some of the industry's best photographers and editors as they race against the clock to send images to the wire. 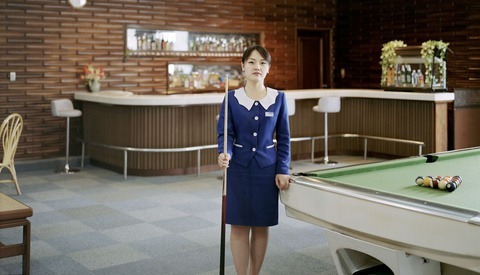 After working to get permission to bring a camera into North Korea for over a year, Charlie Crane finally did make his trip, camera in hand, back in 2007. Cell phone confiscated and accompanied by two 'guides' throughout his stay, Crane knew he wouldn't get what he necessarily hoped to get. So he did the next best thing and shot exactly what they wanted him to. 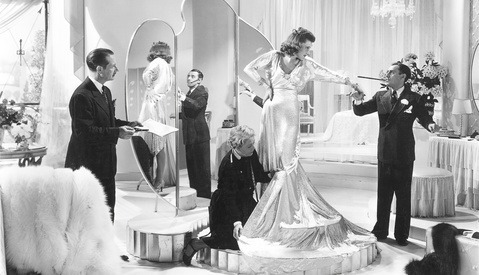 The resulting images are an astonishing work that launched his career into the spotlight. 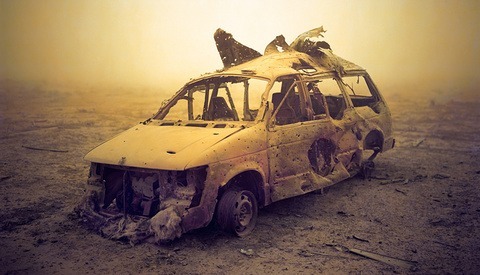 Photographer, Richard Mosse captured some amazing images while he was spending time with American troops in Iraq. The images in his series titled Nomads, juxtapose a smooth, fluid background with jagged, rough, sharp subject matter. The composition forces you to look at the holes and the ripped metal and it's made even more powerful because of the lifeless, smooth, gorgeously lit backgrounds. 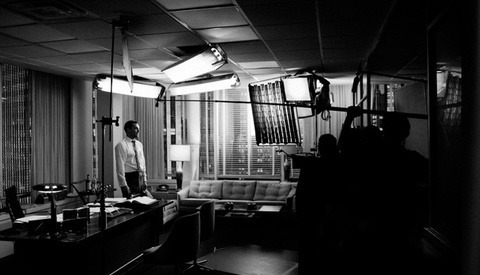 AMC's Mad Men has to be one of the most popular television shows on the air. The imagery, lifestyle, and personalities dramatized in the series have really gripped the American public. Even the style of the period is making a bold comeback, going so far as to inspire a whole collection for men and women at Banana Republic. In this series, photographer James Minchin III gives us a behind the scenes look at the making of the magic. Yesterday marked the 65th anniversary of the dropping of an atomic bomb on Hiroshima. 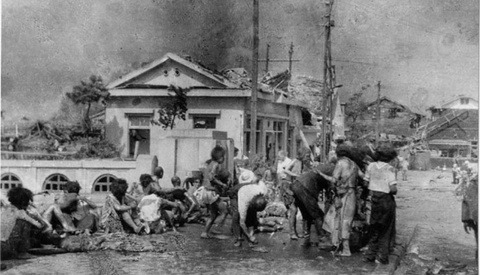 After the bomb was dropped, censorship of the event was a priority in both Japan and abroad, and journalists were barred from entering, reporting, or photographing the area. 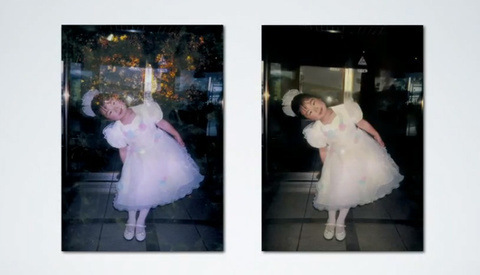 Yoshito Matsushige was living just outside of the blast radius, and snapped some of the only known photos of the aftermath. They are a grim reminder of the event, a testament to the power of a photograph, and a testament to the gruesome reality of World War II. A cinematographer's job is to bring the director's vision of a story to life. A hard, but rewarding job indeed. With the wide availability of high definition cameras right at the masses' fingertips, the art of cinematography is growing and changing constantly. I myself have always been fascinated by how different cinematographers interpret light, color and mood. 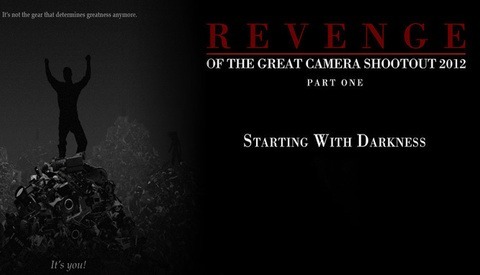 Zacuto is back with its Emmy award winning web series, The Great Camera Shootout. This year though they've gone in a different direction. 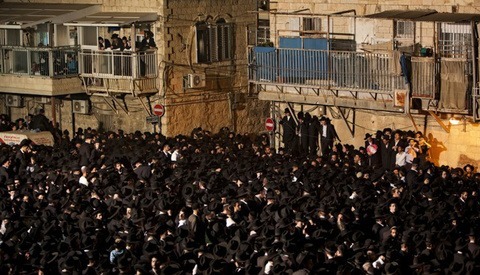 The current issue of TIME Magazine is focusing on the growing population of the ultra-Orthodox community in Jerusalem and the way it changes the city. They sent Israeli photographer and Pulitzer Prize winner, Oded Balilty, to photograph ultra-Orthodox families and neighborhoods, and the results are really amazing. It looks like the images were taken in a different universe or time. World War II changed the world, no doubt. But many of these changes likely weren't even predicted. What seems so normal now was a rare occurrence before the war: women working real jobs (and getting paid to do it). World War II really changed the way the world saw women in the workplace, giving them a place there to begin with. 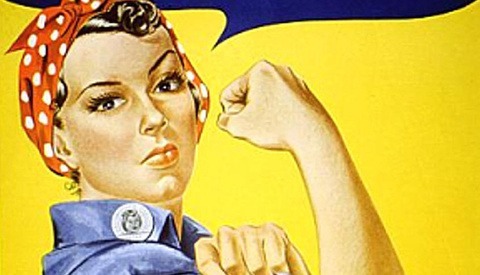 Blogs.Babble.com posted an article including 20 photos of these hard-working women -- a movement that led to the now-famous "We Can Do It" slogan.